Aboard the Sarape, you'll have the opportunity to see Puerto Vallarta from the sea - a sight nobody should miss. Your first stop will be Los Arcos, an underwater marine preserve, for incredible snorkeling among beautiful multi-colored tropical fish. Then it's on to beautiful Las Animas Beach, with it's tall palapas where you can partake in many beach activities. 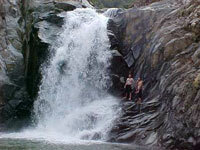 You'll then have a chance to see the waterfall at Quimixto before your day is over. On the trip back to Vallarta, we'll have a great time with entertainment, music, games, and lots to eat and drink. A full day of fun at a bargain price! Runs: Daily at 9:45AM from Marina Vallarta. Includes: Open Bar on board the boat, Breakfast, Lunch, Snorkeling Gear, Bilingual Guides, Music to Dance To, Onboard Games and Contests. Optional Horseback Riding. Departs From: The Marina in Puerto Vallarta. Directions will be provided with your confirmation.